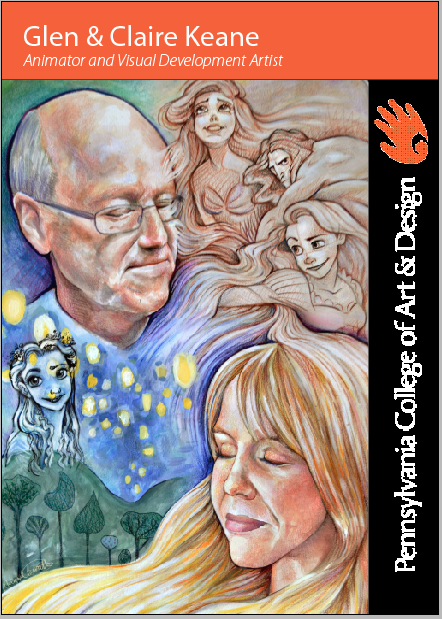 Every Monday, on the Pennsylvania College of Art & Design blog, a different profile of an artist is posted. These are taken from a classroom project where the illustrators and fine art students create “Artist Trading Card,” first researching the facts and style of a selected artist, then making a trading card that captures the spirit of the artist. Three PCA&D sophomore illustration majors, Abigail Bonett, Ariana Pluchinsky and Ashley Obenstine, will take us through their Art Card Projects in this and subsequent blogs. Today features Abigail Bonnett's project on Glen and Claire Keane. I chose to illustrate Glen and Claire Keane for my project because their artwork inspires me to more genuinely show emotion in my art and to explore moments of true character introspection. They have a way of visually communicating and capturing the essence of a character, which is really powerful. Anyone who grew up in my generation has seen this in Glen and Claire's contributions to Disney Animation, and it’s something I have loved since I was a child. It is artists like them who showed me what art is capable of sincerely making us feel, and who motivated me to turn the desire to illustrate from a hobby into a passion and a career. My name is Abigail Bonett. I am from North Brunswick, NJ and went to North Brunswick Township High School. My major is illustration, and I am very interested in working in the field of animation and visual development, much like these two artists. I have always admired how something as imaginary as a cartoon mermaid yearning to live on land or a lost princess longing to see floating lanterns could cause me to respond with such real feeling. My dream for my career is to be able to help give that joy to other dreamers like me. I tried to show the emotion of the character sketches and visual development artwork, depicting key images of their work in their signature styles. They really believe in their characters and try to live in the character's shoes, so the realistic portraits of them sort of transform into the stylized characters they put so much heart into. Both Claire and Glen worked on Tangled, so one of the things I wanted to point out was their close, working relationship and how together they helped form Rapunzel’s character. Glen says that Claire inspired him as he developed Rapunzel, and she talks about how she put so much of herself into Rapunzel's identity as well. I partly tried to communicate this with the element of hair. Because Rapunzel’s hair is a symbol of potential in Tangled, I thought it would be apropos to show the artists bursting with her same creative potential. Also, Glen often says that the eyes are the window to the soul. So, I wanted to depict both of them with their eyes closed and let the "soul" come through in the expressions of the character sketches. I hope that this portrait reflects a genuine depiction of who they are as artists. I started out making very rough sketches and thumbnails, trying to come up with a strong concept. Once I had something I liked, I drew up a more refined sketch with more resolved decisions about where I would put things and how I would draw the different elements. I also drafted a Photoshop document with my character sketches scanned in to help me with the layout of my composition. Once I defined what I wanted to put where, I printed out a bunch of reference material and started drawing my final piece. Once I had my final line drawing, I decided how I would execute its rendering. This is a mixed media piece. I used Watercolor, Watercolor Pencils, Acrylic Paint, Colored Pencils, and Ink. Once I had a rough plan, I developed each section of the piece until I was satisfied and until it felt unified. Glen ended up studying animation because his portfolio was sent and accepted to the wrong school. His father, cartoonist Bil Keane, worked on the long-running newspaper comic, The Family Circus. Glen was the supervising animator for many famous Disney characters such as Ariel, Tarzan, and Rapunzel. He loves characters that believe the impossible is possible. Claire is Glen’s daughter and designed Rapunzel’s murals in Tangled. She sketched her daily life to figure out who Rapunzel was before she could design her paintings. She once wanted to be a fashion illustrator, but realized her passion for character development when she took more interest in the people wearing the clothes. Claire lived in Paris for 8 years and studied at the Ecole Superieure D’Arts Graphiques.